........ I give you not one, not two, but four products from VUPbaby worth over £66. I first came across VUPbaby when I noticed they were following me on twitter. I had a wee nip over to their site and was mightily impressed and now I have some of their products I swear by them. Such good quality! The first item is a cute elephant. Super soft and huggable, these toys are perfectly safe for small children as the toys are lined beneath the crochet to safely contain the stuffing. 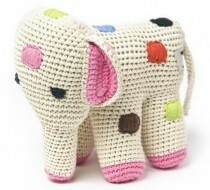 The Anne-Claire Petit elephant is very popular amongst the soft toys offered by fabulous designer Anne-Claire Petit. 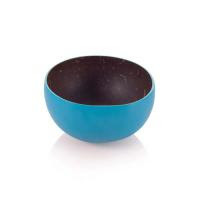 Second up is a fabulous wee bowl made out of a coconut. So environmentally friendly and very, very tactile. Bambu are well known for their innovative design, and this time their innovation is using their lacquering skills on basic coconut shells - turning them into stylish food-safe bowls. Each bowl is made from half a coconut shell. The coconut flesh is removed and the bowls are then cleaned and polished. The inside is finished with a durable food safe PU lacquer which means the bowls are suitable for hot and cold food. Although not dishwasher safe, they wash easily in warm soapy water. 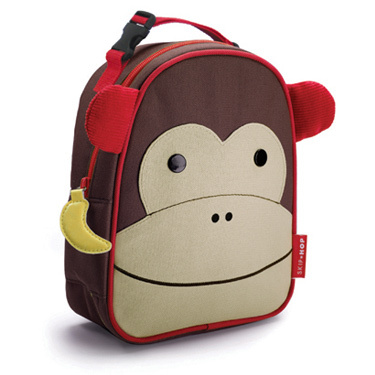 Third up we have a lunch box that is surprisingly big, which would suit an adult or child. The Goodbyn Original Lunch Kit utilizes five compartments perfectly sized — and perfectly designed — to keep kids' lunches from spilling, sloshing or mixing. Sandwiches won't taste like your banana and your fresh fruit won't have biscuit crumbs in it! 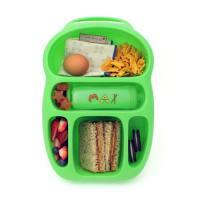 The Goodbyn lunchbox is dishwasher-safe and made to last. Plus when it's time for a new one, the Goodbyn lunchbox is 100 percent recyclable, and with hundreds of stickers, you'll love designing their own one-of-a-kind, super cool lunchbox! The last part of the prize has to be the best. The cutest lunchbag ever! The Skip Hop Lunchies have friendly faces and matching zipper-pulls and are rapidly becoming very popular with toddlers. Their sizes are just right for little children, or a mum and baby on the move. The Skip Hop Lunchies has plenty of space for sandwiches, snacks, drinks and more. They have an insulated, wipe-clean interior that keeps food and drinks cold, plus an inside mesh pocket holds lunch money, utensils or an ice pack. They also have write on name tags inside. Now I know you just went "Awwwww!". Don't deny it! You make a trip over to VUPbaby and have a look. VUPbaby have kindly given me a code for you to use if you order within the next week for 20% off. The code is TIN20. So if you would like to win all these goodies and you live in the UK, then here is what to do. 1. Leave a comment to say you would like to win a copy of Step-by-Step Baking. 2. Follow Tinned Tomatoes on google connect or networked blogs (down the side panel) and leave a second comment to say you have done so. 3. Follow me @tinnedtoms on twitter and leave a separate comment to let me know you have done so. 4. Follow @VUPbaby on twitter and leave a separate comment to let me know you have done so. 5. Tweet the competition using (Win £66 worth of goodies from @VUPbaby - 12 Days of Christmas Giveaway #competition #win http://www.tinnedtomatoes.com/2011/12/on-seventh-day-of-christmas.html #competition #win) and leave a separate comment to say you have done so. 6. Like the Tinned Tomatoes Facebook Page and leave a separate comment to let me know you have done so. If you add everything into one comment you will only get one entry, so remember to write a separate comment for each entry. 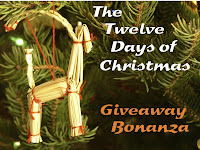 The giveaway runs until 30 December 2011 and the winner will be announced on 31 December 2011. This giveaway is open to UK residents. I would love to win your VUP Baby collection! I would love to win VUP bundle. Lovely giveaway Jac. You are still asking us to ask for step by step cooking but I'm sure you mean you would like us to say why we would like to win this VUP collection. Well, I would like to win it because I covet that coconut bowl and it would go no where near my grandson ;) He can have the rest, but if I win, that bowl is mine! I am now following VUP baby. I now like VUP baby on FB - all done! I'm following you on google connect. I have nephews and nieces and I am sure one of them will appreciate these goodies, but personally I got my beady eyes on that coconut bowl. I would love to win a copy of Step-by-Step Baking! I am following you blog via GFC!!! i would absolutely love the VUPbaby collection!! thanks for sharing such fab finds. Bubs hasn't even been born yet and I'm imagining what lovely lunches I could put into that sweet little monkey bag! I wouls like to win a copy of Step-by-step Baking. I follow Tinned Tomatoes on GFC. I follow @tinnedtoms on twitter. I follow VUPbaby on twitter. I like the Tinned Tomatoes facebook page. I like the VUPbaby facebook page. I'd like to win the VUPbaby collection. I wanted to say that was what I wanted to win but wasn't sure if it was a simple intelligence test. It's a lovely collection, anyway.